Anthracnose | Infonet Biovision Home. Anthracnose on ripe mango fruit (Colletotrichum gloeosporioides). Anthracnose initially appears as small black spots. On leaves, the spots can grow to form an irregular patch. On young fruit, pin-sized, brown or black, sunken spots develop. 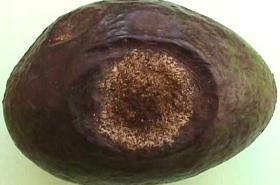 Anthracnose (Colletotrichum gloeosporioides) on avocado fruit. 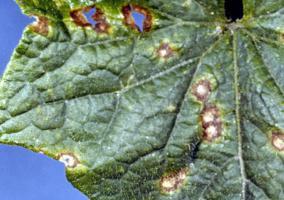 Anthracnose (Colletotrichum orbiculare) damage to pumpkin leaf (Cucumis sativus). 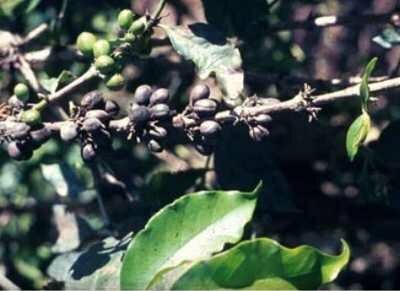 Anthracnose (Colletotrichum coffeanum) on coffee (Coffea arabica) plant. Branch with mummified berries. (c) Jurgen Kranz. Courtesy of Ecoport (www.ecoport.org). Anthracnose (Glomerella cingulata) on yam (Dioscorea alata). On cotyledons and leaves, lesions are often dark, necrotic, angular or irregular in shape. They may be pale with less necrosis. 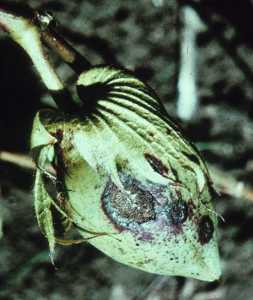 A more general spreading necrosis turning to leaf blight may also occur. Colletotrichum spp. / Gloeosporium spp. / Glomerella spp. / Sphaceloma (Elsinoe) spp. Anthracnose caused by the pathogen (Colletotrichum gloeosporioides) is found worldwide, although it is more abundant in the tropics and subtropics than in temperate regions. The map shows its distribution that has been documented in the literature since 1973. Anthracnose are diseases of the foliage, stems, or fruits that typically appear as dark-coloured spots or sunken lesions with a slightly raised rim. Some cause twig or branch dieback. In fruit infections, anthracnose often has a prolonged latent stage. In some fruit crops, the spots are raised and have corky surfaces. Anthracnose diseases of fruit often result in fruit drop and fruit rot. Anthracnoses are caused by fungi that produce conidia within black fungal fruiting bodies called acervuli. Colletotrichum species are responsible for most anthracnose diseases. They are found in nature mostly in their conidial stage (asexual) and can overseason as mycelium (fungal threads) or conidia (spores) in foliage, stems, twigs and infected crop debris. Colletotrichum diseases are the most common anthracnoses and are very similar, if not identical, to the diseases caused by Glomerella. The latter is probably the sexual stage of most or all species of Colletotrichum (Gloeosporium). 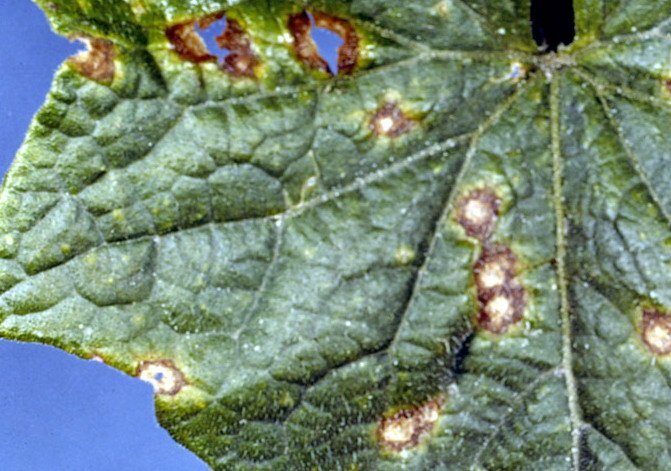 Anthracnose diseases, particularly those caused by Colletotrichum (Gloeosporium) or Glomerella fungi, are very common and destructive on numerous crops and ornamental plants. Although severe everywhere, anthracnose diseases cause their most significant losses in the tropics and subtropics. The diseases are favoured by wet, humid, warm conditions. They are spread by infected seed, rain splash and moist wind. Anthracnose diseases, particularly those caused by Colletotrichum (Gloeosporium) or Glomerella fungi, are very common and destructive on numerous crop and ornamental plants. Although severe everywhere, anthracnose diseases cause their most significant losses in the tropics and subtropics. 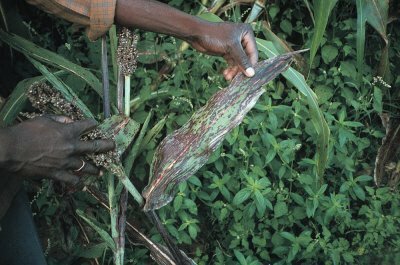 Pre- and post-harvest losses of many high-value crops are substantial in the tropics due to of various diseases caused by C. gloeosporioides. Flower infection on mangoes (blossom blight) can destroy flowers and young fruit and cause complete crop failure. 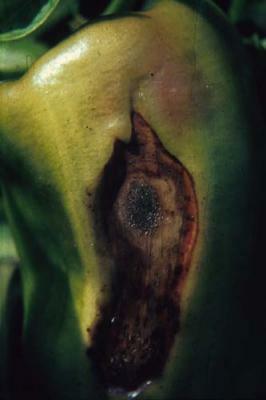 Fruit infection may cause premature fruit drop, but major fruit losses occur during ripening when quiescent (dormant) infections break out and cause spreading black lesions. 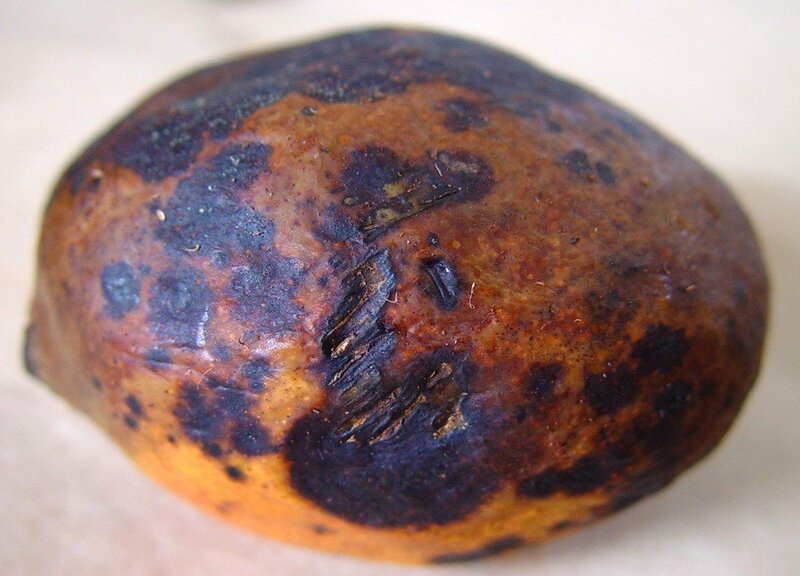 Anthracnose of other fruits also causes major post-harvest losses. Heavy infections cause rapid rotting, and even light infections which cause mainly cosmetic damage will shorten fruit storage life. Because of variability between seasons and locations, overall figures for losses are difficult to give, but it is clear that in many mango-growing areas losses of up to 50% of the crop to the various stages of the disease would not be uncommon. Of the foliage diseases caused by C. gloeosporioides, yam anthracnose can be one of the most economically damaging and may prevent significant growth of tubers if the disease strikes early. Anthracnose infected vegetables (e.g. beans, brinjals, peas, pepper and cucurbits) and fruits (e.g. avocado, mangoes and bananas) are not acceptable for export market. 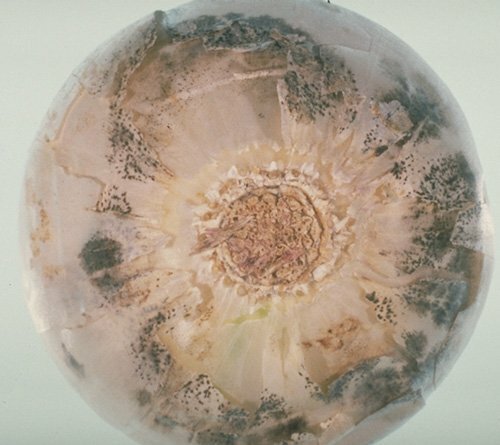 C. gloeosporioides is a fungus which causes anthracnose, it is by far the most predominant a major Colletotrichum pathogen on a wide range of cultivated crops, particularly tropical perennial crops (Waller, 1992). However, because it is also a commonsaprophyte and secondary invader of damaged tissue, it has been implicated as a pathogen more often than is justified after closer investigation. Disease is favoured by wet/humid, warm conditions. It is spread by infected seed, rain splash and moist wind. 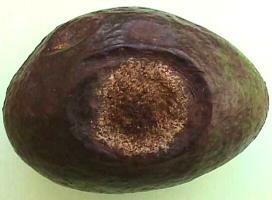 Anthracnose (Colletotrichum gloeosporioides) on avocado fruit. This fungal disease is primarily a post-harvest problem when fruit is at maturity stage. 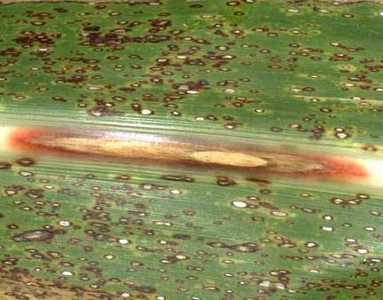 Anthracnose diseases attack all plant parts at any growth stage. The symptoms are most visible on leaves and ripe fruits. At first, anthracnose generally appears on leaves as small and irregular yellow, brown, dark-brown or black spots. The spots can expand and merge to cover the whole affected area. The colour of the infected part darkens as it ages. 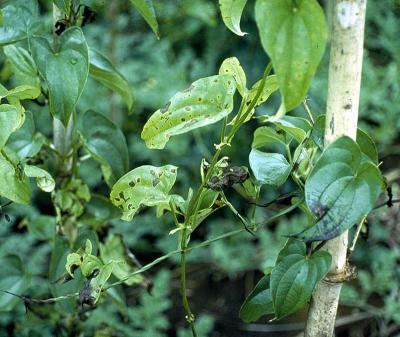 The disease can also produce cankers on stems. 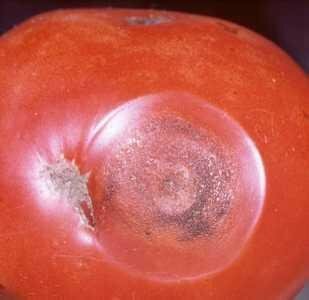 Infected fruit has small, water-soaked, sunken, circular spots that may increase in size up to 1 cm in diameter. As it ages, the center of an older spot becomes blackish and emits gelatinous pink spore masses. Flowering stage, fruiting stage, post-harvest, seedling stage, and vegetative growing stage. Leaves, stems, fruits/pods, and inflorescence. 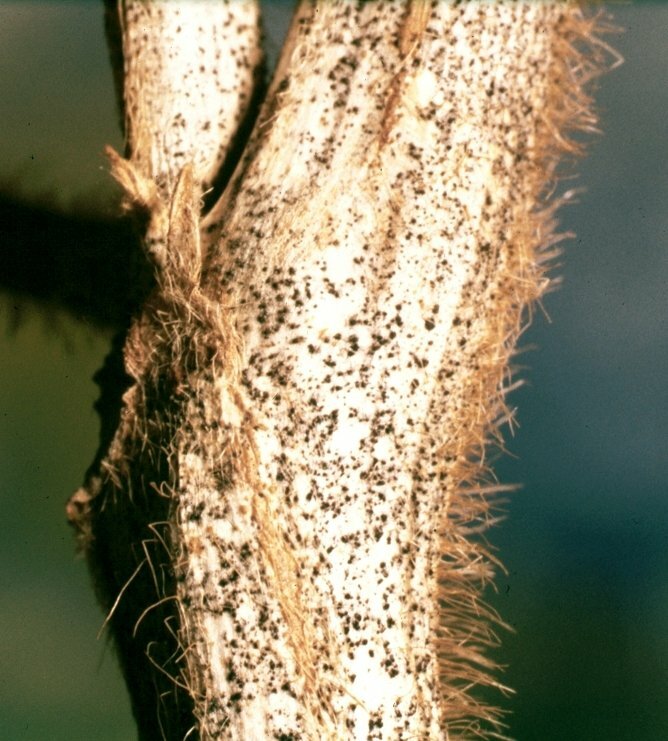 Anthracnose is a common name of plant diseases characterised by black lesions, usually sunken, caused by certain imperfect fungi that produce spores, e.g. Colletotrichum, Gloeosporium and some closely-related Sphaceloma species. The lifecycle of anthracnose diseases involves essentially production of spores on susceptible hosts, dispersal of spores, penetration of host tissue, initiation of an infection process within the cells, development of lesions, formation of bristly spores and dispersal usually by water-splash, air currents, insects or other forms of contact. The anthracnose pathogen reaches its most serious dimension at high moisture and warm temperature. For example C. gloeosporioides has an optimum of 25-29degC but it will also survive at temperatures as low as 4degC. Spore germination, dispersal and infection require relative humidities near 100%. However, in drier situations disease expression can occur when latent infections are activated through aging or tissue damage. The anthracnose diseases are primarily transmitted through seed, but also through infected plant parts. Rain splash will also disperse spores within crop canopy. 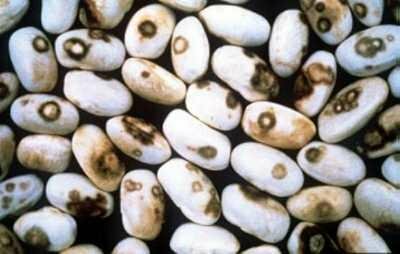 The pathogen persists on and in seed, crop residues, and weed hosts. Further below you find concrete preventive and curative methods against Anthracnose. Field sanitation is an important and highly effective farm practice to keep most diseases under control. 1. Use certified disease-free seeds . Anthracnose is seed-borne. 2. Properly select healthy plants for transplanting. 3. Keep weeds under control at all times. Keep the surroundings of your farm free of weeds, unless they are maintained and intended as habitat for natural enemies. 5. Pull out plants that are heavily infected. 6. Prune the plant parts of fruit trees that show severe symptoms of disease infection. 7. Properly dispose of all the infected plants. 8. Pick rotten fruits and collect those that have dropped and bury in a pit. 9. Plough-under the crop residues and organic mulches. This improves soil condition and helps to disrupt the disease lifecycle. 10. Maintain cleanliness on the irrigation canals. 11. If possible, remove all the crop residues after harvest. Add these to your compost pile. 12. Make your own compost. Your compost pile is where you can place your plant trimmings and other plant debris. 13. Clean your farm tools. Wash ploughs, harrows, shovels, trowels and pruning gears after use. Lightly oil pruning gears. When using own seed, treat the seed with hot water. For more information on hot-water treatment of seeds click here. There are many copper compounds that are used as fungicides. The most common are derived from copper hydroxide and copper oxychloride. These products are cheap and are readily available in most African countries. They are sold under different trade names. It is accepted in organic farming provided that the number of applications is strictly followed and a proper soil amendment is observed to prevent copper accumulation in the soil. In organic culture it is advised to consult your organic certification body. Also as copper products constitute propriety products, users are advised to comply with product label instructions on dosage, frequency of application, pre-harvest intervals and product safety (proper handling, storage, and disposal). Some examples of available copper products in the market include Kocide 101(r), Kocide DF(r) and copper oxychloride. Ask for assistance from your local agriculture office when using copper for the first time. Monitor plants regularly and spray only when necessary as copper can accumulate in the soil. For more information on copper click here.